The Parent Teacher Fellowship shall consist of DLS parents/guardians and faculty working together to serve, support, and build the DLS Community. Dues are $50 per DLS family per year. 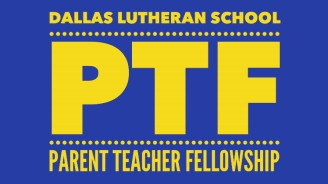 The PTF vision is that every member of the Dallas Lutheran School family is enriched and involved in the life of the School. • To aid in seeking support, financial or otherwise, from all available sources to help meet the needs of the School.